Back To School Breakfast Makeover by Nicole Silber, RD, CSP, CDN - Energetic Juniors - Contact Us! 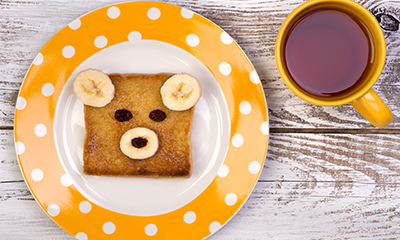 To kick-start the back-to-school season, we’re going to be talking breakfast. You’ve heard breakfast is one of the most important meals of the day, yet it tends to be the most rushed, and least planned. I often hear about the lack of nutritious options offered in school lunch and snack programs. While you don’t always have a say in their lunch, you do have a say in what they eat before they leave for school. Follow these guidelines, recipes and meal ideas for simple and quick breakfast makeovers that you are your kids will devour. Wishing you all a happy & healthy start to the school year. Bagels, dry cereal and English muffins may be quick, but they do not provide enough nutrition to get your child through his or her day. For balance, include at least 1-2 of the following: protein, heart healthy fat, fruit and vegetables. See my top 10 breakfasts below to learn how to use these components to make a balanced breakfast. Your child needs carbohydrates to fuel his or her day, but grains are not the only sources of carbohydrates. You can find the needed carbs in fruit, as well as in milk and yogurt, which have a blend of both carbohydrates and protein. While carbs fuel the brain, protein, fat and fiber help reduce hunger throughout the day, holding your little one until his or her lunchtime. These nutrients can come from a variety of foods, like yogurt, cottage cheese, milk, nuts, seeds, nut butters, vegetables, fruit, quinoa, coconut, olive oil, eggs and turkey. 4. Alternate out cold breakfast cereals. Most cereals and granola, even the unsweetened, high fiber options, tend to quickly raise and drop blood sugar levels, creating more hunger and cravings. The main benefit of cereal is the milk, but most kids leave the milk in the bowl along with its protein and calcium. If cereal is a must in your house, start alternating it out every other day and choose one with up to 5 grams of sugar per serving, like Kashi Heart to Heart, Nature’s Path Mesa Sunrise, Barbara’s Puffins or Cascadian Farms Purely O’s. Mix in some seeds (hemp seeds work well), crushed nuts and fruit to add more nutrition to the bowl. 5. Make your own pancakes & waffles. Just like cold cereals, store bought frozen pancakes and waffles tend to be high in sugar and low in protein, fiber and healthy fats. If you make your own, you can add in nutrition with ground flaxseeds, vegetables and cottage cheese for protein. Batch making and freezing is a good time saving strategy. Fruit has tons of benefits, but it still has natural sugar. And, too much fruit is ultimately too much sugar. Keep to a single serving, especially in smoothies. One serving of fruit is equivalent to 1 apple, ½ grapefruit, 1 orange, 1 small-medium banana, 1 ½ cups cut melon, 1 cup of berries, 15 grapes, and 2 small kiwis. Juice adds up, so replace it with a single, whole fruit. If your smoothie recipe calls for juice, swap it out for milk. Sugar creeps up on us, so start the day without any added sugars. Skip the sweetened cereals, Nutella (you hear that Dad? ), sweetened nut butters, syrups and jam. 100% pure maple syrup and honey are natural, but are still added sugars, so be keep to 1 spoon. When it comes to yogurt, read the labels because some sweetened yogurts have more sugar than a candy bar. If your kids are used to sweetened yogurts, try 2% plain greek yogurt sweetened with fresh fruit or sugar-free jam. Or, go for yogurts with under 10 grams of sugar per serving. Plain yogurts with higher fat contents (2% milk-fat) are more palatable than fat free versions. Wallaby’s 2% plain greek yogurt and Siggi’s flavored yogurts are my top picks. Most kids don’t drink enough. Add water or milk to the morning routine. 10. Table time for 10 minutes. “I’m not hungry” is too commonly heard. While force-feeding should be avoided, start getting your kids to sit at the table screen-free for 10 minutes. If every breakfast last year was on-the-go, start by making Mondays and Wednesdays sit down breakfasts. And, mom and dad should practice this too. A sit down breakfast doesn’t need to translate into a labor intensive spread. Look for make ahead breakfast recipes in my next blog post. Nicole Silber, RD, CSP, CDN is a pediatric and family nutritionist. She is the Director of Pediatrics at Middleberg Nutrition in NYC. For more information contact her at nicole@middlebergnutrition.com or visit www.middlebergnutrition.com.